Frontier markets, or pre-emerging markets, represent a diverse group of equity markets of small and developing nations that typically exhibit a higher macroeconomic risk profile and lower levels of liquidity and market capitalization in comparison to the equity markets of emerging or developed economies. These differences in market characteristics create diversification opportunities for investment and portfolio management purposes. The objective of this article is to model the dynamics of volatility transmission from the mature global stock markets of France, Germany, the United Kingdom, and the United States to the frontier markets of Africa and the Middle East. VAR and GARCH models of returns are estimated to determine evidence of interdependence and volatility spillover from global mature stock markets to the frontier stock markets of Africa and the Middle East. The evidence reported is mixed, suggesting a varying level of volatility spillover and the leverage effect. This varying response to global stock market shocks reveals that frontier nation stock markets are not yet fully integrated with the global economy. The bedrock of investment management and, more specifically, the portfolio construction process is modern portfolio theory, which postulates that a portfolio of noncorrelated assets—distributed across the risk spectrum—can lower the overall risk of a portfolio (Markowitz ). Because assets with low correlation provide diversification opportunities, investors are always interested in securities from international economies that are fundamentally different. As developed and emerging markets continue to mature and integrate and converge with global equity markets, frontier markets offer a compelling opportunity for international investors to achieve exposure to uncorrelated growth. The term frontier market is used to refer to equity markets of smaller, recently liberalized, albeit investable, economies (FTSE Russell ). Over the last two decades, emerging or recently developing economies have achieved high growth in their economic and employment activities through political and economic liberalization and the globalization process (Collins and Abrahamson ). For a sample of emerging and developing economies, Bekaert, Harvey, and Lundblad  reported that the market liberalization process, on average, leads to a 1% increase in annual economic growth. Although several studies in the finance literature have examined the topic of global integration of mature and even some emerging equity markets, very little research has focused on the topic of the global integration of recently liberalized markets or frontier markets, which are often referred to as pre-emerging emerging markets. Global integration in international financial markets system is known to increase vulnerability to foreign influences, particularly to a reversal in capital during times of financial turmoil and to cross-border contagion (Collins and Biekpe ; Bekaert, Harvey, and Lundblad ). Therefore, an understanding of interdependence and volatility transmission from mature markets to pre-emerging and less mature financial markets is an important issue to research to understand the benefits of liberalization. In addition, the bulk of the current literature on global volatility spillover has focused on understanding the dynamics of mature stock markets while ignoring the newly liberalized or less mature stock markets that are appearing on the investable horizon. Among the recent additions to investable markets are the frontier markets of Africa and the Middle East region. In addition to providing an opportunity for portfolio diversification, these markets are potentially of interest for economic growth. According to the Economic Intelligence Unit (EIU) , overall long-term continued gross domestic product growth for the Middle East and African region for an otherwise depressed global economy is projected to be around 3.5% to 4.5%. Several of the Middle East and African economies had, in part, been benefiting from revenue generated from the rising global energy demand since the early 2000s. Energy product export revenues supported these nations’ infrastructure growth, promoting regional trade and industrial activity, bringing liquidity to the financial markets of these pre-emerging economies. Political and economic reforms in the last two decades, although heterogeneous, have been another factor for the economic development of Middle East and African economies. Notable among political, social, and economic reform was the establishment of the Gulf Cooperation Council in 1981 (United Arab Emirates [UAE], Bahrain, Saudi Arabia, Oman, Qatar, and Kuwait), the Maghreb alliance in 1989 (Morocco, Algeria, Tunisia, Libya, and Mauritania), the signing of the Euro-Mediterranean partnership in 1995, and the opening of Middle East and North African (MENA) equity markets to foreign direct investment during the early 2000s (Neaime [2006a]). Since then, this region has gradually made structural changes to its financial markets and institutions while enhancing its efficiency policies to attract foreign and domestic investment (Neaime [2006b]). To examine the fundamental characteristics of Middle East and African equity markets, researchers have focused on topics such as the extent of economic and financial integration among the Middle East and African region markets (e.g., Darrat and Pennathur ; Zarour and Siriopoulos ; Hammoudeh, Yuan, and McAleer ; Dania and Spillan ); regional stock market efficiency (e.g., Civelek ; El-Erian and Kumar ; Lagoarde-Segot and Lucey ; Abdmoulah ); understanding the issue of volatility spillover among domestic sectors (e.g., Hammoudeh, Yuan, and McAleer ); spillover from the U.S. equity market to markets of oil-rich nations such as Saudi Arabia and Bahrain (e.g., Abraham and Seyyed ; Alsubaie and Najand ); and spillover among oil, U.S., and Gulf equity markets (e.g., Malik and Hammoudeh , Chang, McAleer, and Tansuchat ). Additionally, there have also been studies that focus on understanding the risk component of investing in the Middle East and African equity markets. An area of research that has received little attention, however, is the dynamics of interdependence and volatility transmission of the frontier markets of Middle East and African countries and major global equity markets. This issue is important because the recently liberalized or currently being liberalized equity markets of the Middle East and Africa may be susceptible to asymmetric spillovers effects from global equity markets. It is well recognized that as markets mature, they become progressively more sensitive to shocks and volatility spillovers from global stock markets during the globalization and liberalization process (e.g., Hamao, Masulis, and Ng ; King and Wadhwani ; Edwards and Susmel ). Regardless of existing research on the behavior of stock markets of developed and emerging markets, very little is known about the behavior of frontier equity markets, such as their sensitivity to volatility spillovers from global markets. This study provides evidence of the nature of the sensitivity of the frontier equity markets of the Middle East and Africa to global equity markets. Another contribution of this study is the examination of this topic accepting that underlying data are likely to follow a stochastic process—previous studies on the global integration of developing or pre-emerging emerging markets may have overlooked this critical assumption. Prior evidence suggests that the return distributions are not symmetric for developed markets (Harvey and Zhou ) and emerging markets (Harvey ). Therefore, if we have two or more nonstationary time series, any regression analysis involving such time series, without adjusting for stochastic properties, may lead to the phenomenon of spurious or nonsense regression (Gujarati ). Moreover, regressing a nonstationary time series on one or more nonstationary time series will often result in a high R2 value and finding some or all of the regression coefficients to be statistically significant on the basis of the usual t and f test. A time series analysis of such a dataset, with an assumption that underlying variables may reflect stochastic and not linear behavior, will reveal important and distinct heterogeneity patterns in economies in transition, such as whether they are in an embryonic, low-activity, or active phase or have reached maturity (Derrabi, de Bodt, and Cobbaut ). Heterogeneity relates to the size of the market; the nature of its fragmentation and segmentation; aggressive growth of listed indexes; the level of concentration of capital (i.e., whether in the hands of many or a few); regulation; liquidity; and uncertainty among investors for social, behavioral, or risk averseness reasons (Derrabi and Leseure ). Important disparities may also exist in the market microstructure of frontier markets and their economic activity level (Bekaert and Harvey ). Investigating underexplored equity markets, such as frontier equity markets, will allow academicians to comprehend the dynamics of the interdependence of the recently formed heterogeneous stock market and global markets. Results from this study will also allow policymakers of the Middle East and African region undergoing economic transition to understand the implications of the transmission of risk originating from global markets and formulate policies to mitigate it. We also hope these results will benefit regional and international investors who are interested in investing in the frontier markets of the Middle East and Africa. Using the vector autoregression (VAR) and generalized autoregressive conditional heteroskedasticity (GARCH) methodology on monthly data (between May 2002 and January 2016) of applicable market index returns, we achieved several important results. We found evidence of a varying degree of dependence and volatility transmission between the returns of frontier nations of Middle East and African equity markets and global equity markets. This is consistent with the contention that the frontier markets of Middle East and African markets are heterogeneous in business structure and in channels of interdependence with global markets and underlying volatility transmission. Hence, there exists a degree of opportunity for international portfolio diversification in the frontier markets of the Middle East and African region. These results have important implications for investors, managers, policymakers, and scholars. The rest of the article is organized as follows. “Literature Review” discusses the theoretical background and development of developing and frontier financial markets in the Middle East and Africa region. “Data and Descriptive Statistics” describes the data. “Econometric Methodology” details the econometric methodology used, and “Estimation Results” reports the empirical findings and the results. Finally, “Conclusions and Managerial Implications” concludes. In this section, we briefly discuss two issues concerning this article. First, we discuss the theoretical aspects of observed asymmetries of returns in financial markets. Second, we note the recent developments in the financial markets of the developing and pre-emerging markets of the Middle East and Africa region. Several studies in the finance literature indicate that integrated markets that have assets with identical risk should command a similar expected return irrespective of their location (Bekaert and Harvey ). A consequence of the process of integration is how regional markets react to shocks originating in global markets, that is, whether domestic equity markets react differently to positive as opposed to negative shocks originating in the foreign equity market. Conceptually, response asymmetries may arise from different sources (global factors or domestic factors). If equity market returns are drawn from symmetric distributions, comovements between regional and global markets during upturns and downturns should be similar. Evidence has suggested, however, that the equity return distributions are not symmetric for developed markets (Harvey and Zhou ) or emerging markets (Harvey ). There are several reasons for the asymmetries of returns to occur. For example, they may be caused by the expectations investors might have regarding domestic returns with respect to upturns and downturns in foreign market returns (e.g., Odier and Solnik ; Erb, Harvey, and Viskanta ). A small downturn in a foreign market could potentially have a relatively larger downturn in the domestic market. At times, the downturn might not be due to a decline in a foreign market but rather due to the earnings disappointment of the domestic firms among investors. Therefore, the asymmetry, in this case, stems from investor expectations arising from changes in the stock price of domestic firm(s). Information and investor sentiments grounded on extraneous or incomplete information may also be the cause of asymmetries. Such information is usually biased and is expected to prompt irrational buying or selling. Such actions may lead to variations in capital inflows or outflows from an equity market. According to Aitken , institutional investor sentiment toward developing or emerging markets often controls the price performance of these equity markets. The absence of transparency is a notable cause for delayed or incomplete information about developing or emerging markets (Djankov et al. ). Foreign institutional investors usually lack local information regarding a foreign country’s fundamentals and may treat these markets as inimitable or different. This decision bias and the segmented nature of developing or emerging markets (Harvey ) may often lead to asymmetric responses in equity market returns. Asymmetries among frontier markets may also occur because of unidentified risk factors, which are uniquely priced in individual equity markets because of prevailing domestic business conditions. Fama and French  suggested that market returns are not fully explained by the capital asset pricing model beta, and as a result, there may be multidimensional risk often associated with a specific stock price. One dimension of the risk may be the unidentified risk that may persist in stock prices and markets at large. However, the relationship between the unidentified components of risk and stock returns may not be linear and therefore may lead to dissimilar positive and negative returns for investors (Pettengill, Sundaram, and Mathur ; Downs and Ingram ; Fletcher ). The asymmetry among frontier markets may also be explained from the behavioral viewpoint of investor psychology. Investors, in general, are known to be more concerned about market downturns than upturns because of their risk-averse characteristic. This characteristic is observed in developing and emerging equity pricing, causing greater volatility during market downturns than market upturns. There is ample evidence of momentum and reversals, suggesting an asymmetric effect of investor sentiments on stock market returns (e.g., Hong and Stein ; Hong, Lim, and Stein ). The asymmetric effect of sentiments on the stock market is attributed to the limits of arbitrage (Brown and Cliff ) and overconfidence (Daniel, Hirshleifer, and Subrahmanyam ; Gervais and Odean ). Price movement asymmetries have been studied and documented in Asian markets (Bahng and Shin ), Australian equity markets (Iorio and Faff ), European Exchange Rate Mechanism (Laopodis ), commodity markets (Karrenbrock ; Dania ), goods markets (Peltzman ), and real and underground output in New Zealand (Giles ). It is well known that the characteristics of newly emerging equity markets, such as those in the Middle East and Africa region, differ from those of the equity returns of developed capital markets (Harvey ; Dania and Udemgba ). The distinguishing features of the returns of these newly formed or pre-emerging markets usually are higher average returns, low correlations with global market returns, more predictable returns, and higher volatility. Therefore, an examination of the volatility spillover process enhances the understanding of information transmission between international markets. Research on how one equity market affects another is at the heart of investments and diversification (Bekaert, Hodrick, and Zhang ). When investigating the financial markets of the Middle East and Africa region, it is easy to distinguish economies based on their natural resources. There are oil exporting economies such as Bahrain, Kuwait, Oman, Kenya, and Nigeria, and there are the oil-poor economies such as Mauritius, Jordan, Morocco, Lebanon, and Tunisia. The presence of oil contributes significantly to the financial wealth and liquidity of financial markets these nations (Bontis ). Oil revenue has benefited development-related projects, and governments of energy-rich nations are able to invest in non-oil-based sectors, infrastructure, and education. This has led to demand for sophisticated and high-quality products and skilled manpower, leading to the growth of non-oil-related industry in the entire Middle East and Africa region (Zineldin ). The Middle East and African nations lacking oil resources have been establishing their economies based on the service and manufacturing industries over the last two decades. With a surge in the non-oil-based sector, several Middle East and African economies are quickly catching up and rapidly participating in regional economic expansion and globalization processes (Hirata, Kim, and Kose ). This new business environment is encouraging domestic and foreign investors to invest in the frontier markets of the Middle East and Africa through their financial markets rather than the traditional banking sectors. As the frontier markets of the Middle East and African regional economies shift from being oil-based to service- or manufacturing-based, there has also been a shift in the leverage preference of regional governments in promoting equity-based financing rather than bank-based financing for infrastructure projects and companies. Stock markets in the Middle East and African region, historically, were less important in the channeling of financial funds (Neaime [2006a]). Traditionally, a fairly developed system of commercial banking system channeled funds from savers to borrowers. Since the late 1990s, however, several frontier markets of the Middle East and African region have embarked on a process of political reforms and financial sector liberalization. The national stock markets of these nations are fast replacing the traditional banking system as a source of investment and foreign direct investment (Naceur, Ghazouani, and Omran ). An interesting observation regarding the Middle East and African region is the level of foreign direct investment that is unevenly distributed among its countries. For example, according to Eid and Paua , more than 80% of foreign direct investment stock in the Middle East and North African region is concentrated in five countries: Saudi Arabia, Egypt, Tunisia, Bahrain, and Morocco. Globalization and privatization, although necessary, are not enough for economic growth, as noted by Gentzoglanis . Other reasons for this disparity are attributed to political instability. For example, Lebanon, Algeria, Kuwait, and Libya experienced extended periods of political instability during the 1980s and 1990s, precluding and often discouraging regional and foreign investment (Eid and Paua ). Other restrictions, such as the restrictions on foreign ownership and the slow pace of reforms and privatization of tightly controlled government enterprises, are also factors (Creane et al. ). Attempts have been made to enhance regional competitiveness and international investment among several frontier markets in the Middle East and Africa. Regional economic collaboration has been promoted to reduce the level of risk attached to trading and investment activity in a regional group of countries (Hanson ). The Gulf Cooperation Council (GCC) in 1981 (UAE, Bahrain, Saudi Arabia, Oman, Qatar, and Kuwait) and the Maghreb alliance in 1989 (Morocco, Algeria, Tunisia, Libya, and Mauritania) were created in the MENA region. Economic integration encourages efficient allocation of production factors and effective division of labor (Wu and Chen ). It also reduces uncertainties associated with local governance and a planning system that would otherwise deter potential investors (Phelps and Jones ). Like the European Union, the GCC, having achieved convergence on several macroeconomic indicators, is paving the way for the formation of a monetary union in the region (Espinoza, Ananthakrishnan, and Williams ). For this study, we obtained monthly data between May 2002 and January 2016. As a proxy for foreign markets, we include the major global market returns from France (FRA), Germany (GER), the United Kingdom (U.K.), and the United States (U.S.). To assess the global integration of the frontier markets of the Middle East and African region markets, we include corresponding data for 10 frontier markets from this region: Bahrain (BAH), Jordan (JOR), Kenya (KEN), Kuwait (KUW), Lebanon (LEB), Mauritius (MAU), Morocco (MOR), Nigeria (NIG), Oman (OMN), and Tunisia (TUN). Our data are sourced from the Morgan Stanley Capital Investments Barra database. To eliminate any local currency effect, we use all performance indexes in U.S. dollar terms. We compute the continuously compounded returns for all indexes. Exhibit 1 reports the descriptive statistics for variables. From this exhibit, we can observe that the mean returns for the markets of KEN, NIG, MAU, MOR, MOR, LEB, TUN, FRA, GER, U.K., and U.S. are positive and returns for JOR, BAH, KUW, and OMN are negative. The positive average returns may be attributed to the overall growth in these markets during the sample period. Furthermore, all maximums are positive and minimums are negative. We also note that KEN, MAU, and LEB report a higher mean return than the sample global equity markets. Investors underweight in frontier markets may be missing out on these market returns. Consummate with higher return is relatively higher risk in frontier markets. KEN, NIG, and LEB report a higher standard deviation than the global major markets in our sample. This is indicative of relatively higher volatility in the returns of these markets. The presence of negative skewness indicates a distribution with an asymmetric tail extending toward more negative values. Only NIG, MOR, LEB, and TUN report a positive skewness. A large kurtosis figure (>3) is also observed for all markets in our sample, indicating a relatively peaked distribution. The presence of these observed skewness and kurtosis characteristics further motivate the use of time-series methodology for any result inference. Exhibit 1 also shows that the data do not support the supposition that variables of interest have a normal distribution, which is supported by the Jarque–Bera test results (all variables report a significant p-value). Exhibit 2 reports the correlation among the variables of interest. It is interesting to observe that the correlation among the equity market returns of the reference global markets is much higher compared with the correlation between the global equity market returns and the sample frontier nations’ equity markets returns. In a system of integrated global markets, an investment of the same risk should command about the same expected return no matter where the investment is located, as reflected in markets that have high correlation of their returns. The market integration phenomenon assumes that markets that are highly correlated will have similar systematic risk and growth opportunities. However, if a market is segmented or not integrated, one would see low correlation of such market returns with the global market returns. The relatively higher degree of segmentation of markets that are not highly correlated with the world market is often explained by the dominance of domestic factors. Because the global market returns and the frontier market returns used in this study may act as a system (Brown and Cliff [2004, 2005]), we chose the VAR model developed by Sims  as an appropriate econometric approach to investigate the postulated relationships. where yt is a k vector of endogenous variables, xt is a d vector of exogenous variables, A 1, …, A p and B are matrixes of coefficients to be estimated, and ε is a vector of innovations that may be contemporaneously correlated but are uncorrelated with their own lagged values and with all of the right-hand-side variables. The VAR specification allows researchers to do policy simulations and integrate Monte Carlo methods to obtain confidence bands around the point estimates (Doan ). The likely response of one variable to a one-time unitary shock in another variable can be captured by impulse response functions. As such, they represent the behavior of the series in response to pure shocks while keeping the effect of other variables constant. Because impulse responses are highly nonlinear functions of the estimated parameters, confidence bands are constructed around the mean response. Responses are considered statistically significant at the 95% confidence level when the upper and lower bands carry the same sign. Traditional orthogonalized forecast error variance decomposition results based on the widely used Choleski factorization of VAR innovations may be sensitive to variable ordering (Pesaran and Shin [1996, 1998]). To mitigate such potential problems of misspecification, we used the recently developed generalized impulses technique as described by Pesaran and Shin  in which there is an orthogonal set of innovations that does not depend on the VAR ordering. is the lagged squared shock extracted from the reference global market returns series of interest. The coefficient Ψ represents the volatility spillover coefficient measuring the extent and behavior of the volatility spillover effect. is the lagged squared residual from the reference global market returns series and ψ2 captures the leverage effect on the volatility of the return of the frontier market of interest. If it is positive, then we can assume that a large positive shock in the reference global market returns series will result in a larger observed volatility in the frontier market series returns of interest compared with negative shocks in the corresponding global market returns. Before proceeding with the main results, we first checked the time series properties of each variable by performing unit root tests using the augmented Dickey–Fuller (ADF) test (Dickey and Fuller [1979, 1981]). Based on the consistent and asymptotically efficient AIC and SIC criteria (Diebold ) and considering the loss in degrees of freedom, the appropriate number of lags was determined to be two. In the case of the ADF test, the null hypothesis of nonstationarity was rejected. The inclusion of drift/trend terms in the ADF test equations does not change these results (Dolado, Jenkinson, and Sosvilla-Rivero ). The unit root test results are reported in Exhibit 3. We constructed the generalized impulse responses from the VAR model to trace the response of one variable to a one-standard-deviation shock to another variable in the system. We used Monte Carlo methods to construct confidence bands around the mean response (Doan, Litterman, and Sims ). When the upper and lower bounds carry the same sign, the responses are statistically significant at the 95% confidence level. Sims  suggested that autoregressive systems like these are difficult to describe succinctly. It is especially difficult to make sense of them by examining the coefficients in the regression equations themselves. Likewise, Sims  and Enders  showed that the t-tests on individual coefficients are not very reliable guides and, therefore, do not uncover the important interrelationships among the variables. Sims  recommended focusing on the system’s response to typical random shocks that are impulse response functions (IRFs). Therefore, we analyzed the relevant IRFs and do not place much emphasis on the estimated coefficients of the VAR models. However, for the interested reader, the VAR tables have been provided in Exhibit 4. Now, we focus our attention on analyzing the impact of FRA on the frontier market returns of interest in our study. We estimate VAR models with two lags. Exhibit 5 shows the impact of a one-standard-deviation shock of FRA returns to frontier market returns of interest. We observe an immediate, positive, and significant impact on all frontier markets of interest except TUN. The impact remains longest for the markets of BAH, JOR, LEB, MAU, and NIG (two periods) and then becomes insignificant. Notes: The dashed lines on each graph represent the upper and lower 95% confidence bands. When the upper and lower bounds carry the same sign, the response becomes statistically significant. Exhibit 6 shows the impact of GER return shock to frontier market returns of interest. We observe a varying impact on frontier markets of interest. The impact is immediate, positive, and significant on all markets except for MOR and TUN. The impact is longest for BAH (three time periods) and lasts two time periods for JOR, MAU, and NIG and one time period for KEN, KUW, LEB, and OMN. Now, we turn our attention to understanding the impact of U.K. market returns on the market returns of MENA frontier markets. Exhibit 7 shows the impact, which is immediate, significant, and positive for all markets. The longest is observed for BAH (three time periods) followed by JOR, LEB, MAU, and NIG (two time periods) and then KEN, KUW, MOR, OMN, and TUN (one time period). Finally, we look at how a one-standard-deviation shock in observed returns of the U.S. affects the market returns of frontier markets of interest. We can observe the impact in Exhibit 8. All markets show an immediate, significant, and positive impact. LEB, MOR, and TUN report no impact to the U.S. market returns, while BAH, JOR, KEN, KUW, MAU, NIG, and OMN report an immediate, significant, and positive impact for one time period, after which the impact becomes insignificant. We now estimate the GARCH model by introducing the residuals from global market returns in the variance equation of MENA market returns series. Exhibit 9 reports the result of the spillover effect of market returns of FRA on frontier equity markets. Ψ represents the volatility spillover coefficient. It can be observed from Exhibit 9 that α1 and β coefficients are significant for the JOR, KEN, KUW, LEB, MAU, and NIG market returns, indicating evidence of ARCH and GARCH structure in returns of these returns series. Individually, α1 is significant for MOR and β is significant for OMN and TUN. All significant α1 coefficients in the series are observed to be positive, indicating that volatility increases when past innovations are positive. Ψ is positive and significant for BAH, KEN, KUW, MAU, MOR, OMN, and TUN equity market returns, indicating evidence of volatility spillover from the market returns of FRA. Furthermore, the positive sign also indicates that the return shocks originating in the equity market of FRA increase the volatility of the returns of these frontier markets. A significant yet negative sign is observed for LEB. This indicates the opposite, that is, shocks originating in the equity market of FRA actually decrease the volatility in the market returns of LEB. Exhibit 10 reports the result of the spillover effect of market returns of GER on frontier equity markets. Ψ represents the volatility spillover coefficient. It can be observed from Exhibit 10 that α1 and β coefficients are significant for JOR, KEN, LEB, MAU, and NIG market returns, indicating evidence of ARCH and GARCH structure in returns of these returns series. β is observed to be positive for KUW, OMN, and TUN. All other α1 coefficients, which are significant in the series, are observed to be positive. Ψ is positive and significant for BAH, KEN, MAU, MOR, NIG, OMN, and TUN equity market returns, indicating evidence of volatility spillover from the market returns of GER. Furthermore, the positive sign indicates that the return shocks originating in the equity market of GER increase the volatility among the returns of these frontier markets. Now, we report the spillover effect of market returns of the U.K. on sample frontier equity market returns. It can be observed from Exhibit 11 that α1 is significant for KUW, LEB, NIG, OMN, and TUN. 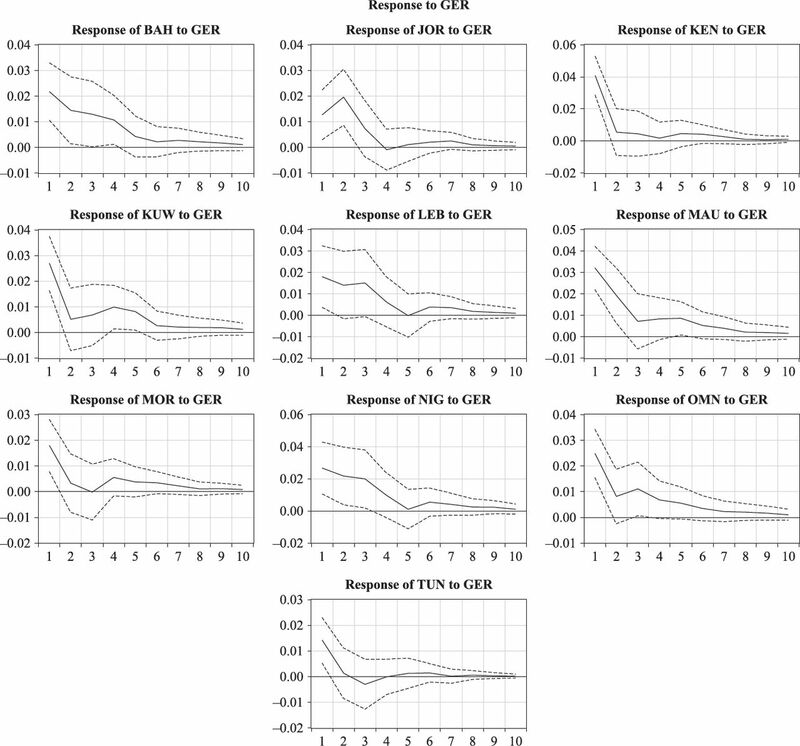 β coefficients are significant for JOR, KUW, LEB, NIG, OMN, and TUN market returns, indicating evidence of ARCH and GARCH structure in returns of these returns series. A negative α1 is observed for KUW, LEB, OMN, and TUN. The negative sign indicates that volatility increases when past innovations are negative. The spillover coefficient Ψ is positive and significant for JOR, KUW, and OMN equity market returns, indicating evidence of volatility spillover from the market returns of the U.K. to these markets. Furthermore, the positive sign indicates that the return shocks originating in the U.K. equity market increase the volatility among the returns of JOR, KUW, and OMN. Exhibit 12 reports the results of the spillover effect of market returns of the U.S. on sample frontier equity markets. 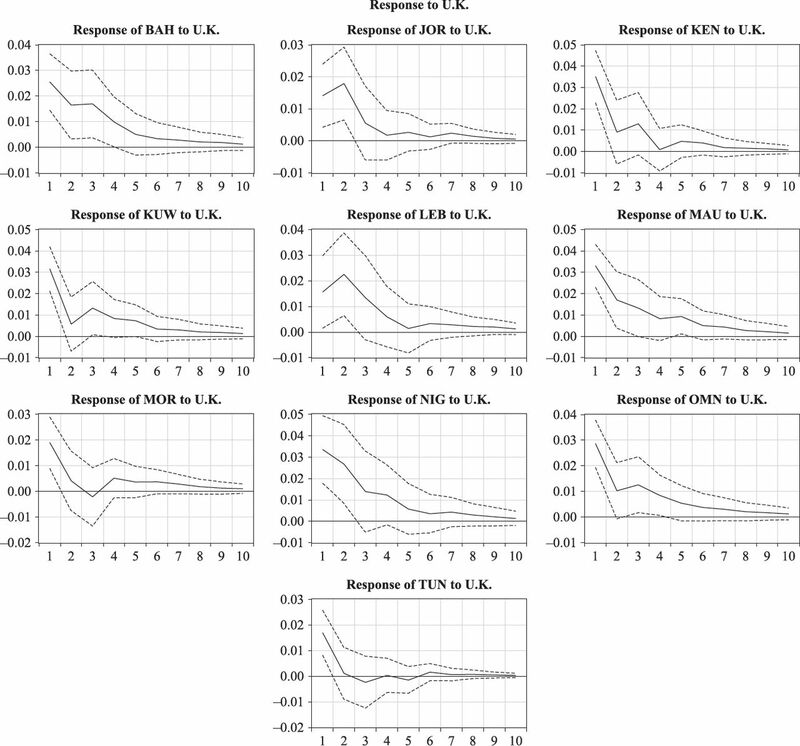 From Exhibit 12, it can be observed that α1 and β coefficients are significant for KUW, LEB, NIG, OMN, and TUN market returns. A negative α1 is observed for KUW, OMN, and TUN, indicating that volatility increases in these markets when past innovations are negative. The spillover coefficient Ψ is positive and significant for KUW and OMN equity market returns, indicating evidence of volatility spillover from market returns of the U.S. to these markets. Furthermore, the positive sign indicates that the return shocks originating in the U.S. equity market increase the volatility among the returns of KUW and OMN. At this point, we shift our attention to understanding the results from TGARCH estimates. This model not only provides information on whether the effect of shock originating from the frontier market’s own return is asymmetric (i.e., reported by α2) but also provides information on whether the effects of shocks from global markets are asymmetric (reported by ψ2). The coefficient ψ1 provides information about the spillover effect from global market returns, and ψ2 captures the asymmetric effect. A significant α2 indicates that the effects from the returns of the frontier market of interest’s own shock are asymmetric. Exhibit 13 reports the TGARCH results with FRA as the global equity market. 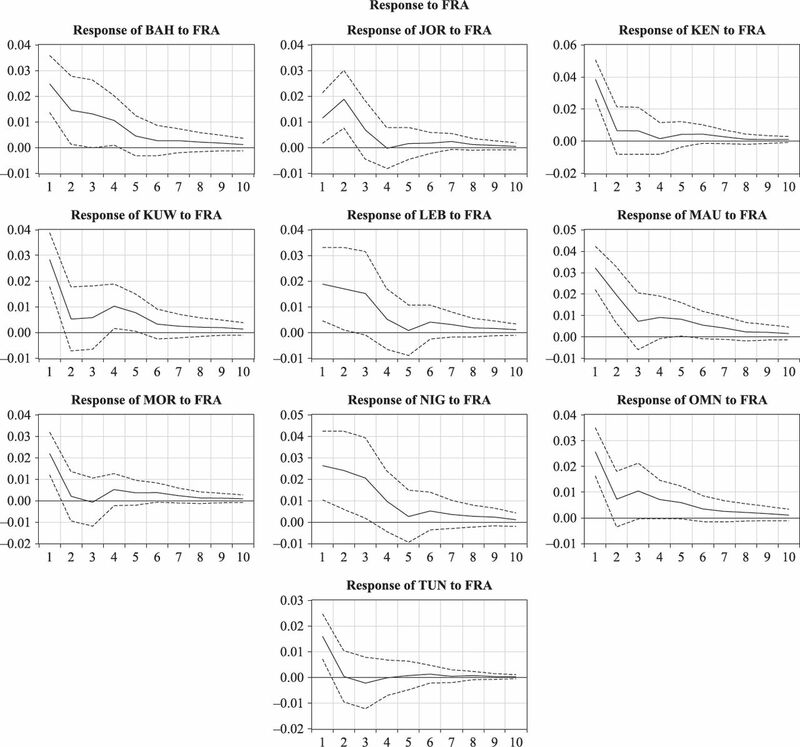 α2 are positive and significant for BAH, JOR, KEN, KUW, LEB, and NIG, indicating that volatility tends to increase more asymmetrically in response to their own negative shock. ψ2 is not significant for any frontier market equity market except for OMN. ψ2 for OMN is found to be positive and significant, which indicates that when there is bad news (negative shock) in the FRA equity market, the volatility of OMN equity market returns is greater than it would have been with a positive shock (good news) of the same magnitude. Exhibit 14 reports the TGARCH results with GER as the global equity market. α2 are positive and significant for KUW, LEB, and NIG, indicating that volatility tends to increase more asymmetrically in response to their own negative shock. ψ2 for KUW and MOR are positive and significant, which indicates that when there is bad news (negative shock) in the GER equity market, the volatility of KUW and MOR equity market returns is greater than it would have been with a positive shock (good news) of the same magnitude. Exhibit 15 reports the TGARCH results with the U.K. as the global equity market. In this case, ψ2 for OMN and TUN are positive and significant, which indicates that when there is bad news (negative shock) in the U.K. equity market, the volatility of OMN and TUN equity market returns is greater than it would have been with a positive shock (good news) of the same magnitude. Finally, Exhibit 16 reports the TGARCH results with the U.S. as the global equity market. ψ2 for OMN is found to be positive and significant, which indicates that when there is bad news (negative shock) in the U.S. equity market, the volatility of returns in OMN market returns is greater than it would have been with a positive shock (good news) of the same magnitude. In contemporary global markets, information is now shared more intensively and acted on across major global equity markets. This causes markets to become increasingly integrated. Political and financial reforms along with globalization and advances in information technology have dramatically changed the structure of the frontier market region of financial markets in Africa and the Middle East. In an integrated market, investors can share their consumption risk efficiently, which in turn decreases the costs of capital firms, thereby stimulating investment and economic growth. In this study, we used a VAR and modified GARCH methodology to determine whether volatility spills over from major world markets to the equity markets of frontier markets in Africa and the Middle East. Inserting the residuals from major world markets into the volatility equations of the sample MENA equity returns does this. There was mixed evidence of significant dependence and positive spillover from global equity markets to the sample equity markets. To test for the presence of asymmetry in volatility transmission or the leverage effect, we used TGARCH methodology. A positive and significant coefficient capturing news effect indicates that when there is bad news (negative shock) in a foreign equity market, the volatility of domestic market returns is greater than it would have been with a positive shock (good news) of the same magnitude. In the case of FRA, a significant and positive relation was found for OMN, and in the case of GER, a relation was observed for the markets of KUW and MOR. Similarly, for the U.K., a positive relation was found for OMN and TUN, and for the U.S., a significant positive relation was found for OMN. Overall, there is mixed evidence of global spillover from the global market to the equity markets of frontier markets in Africa and the Middle East. This finding is consistent with the contention that individual financial markets in this region primarily exhibit their domestic business conditions. Thus, there still exists a limited opportunity for international portfolio diversification in the frontier equity markets of Africa and Middle East that may have been overlooked by international investors. However, this condition may change with the ongoing political and financial reforms and increase in foreign direct investment from within and outside the region. The findings from this article have important implications for investment management, particularly for large pension funds and insurance companies. First, because these frontier markets are still not fully integrated with global capital markets, investments in frontier equity markets should be treated as a separate asset class. Second, any new allocation to frontier markets would also have the opportunity to include new firms seeking capital investments in these markets. Finally, frontier markets still have higher risk than most developed markets, and as a result, investors continue to command higher expected returns. ↵ 1Basic GARCH (1,1) results are not reported in an exhibit because the focus is on spillover effect but are available on request. “Testing the Evolving Efficiency of Arab Stock Markets.” International Review of Financial Analysis , Vol. 19, No. 1 (2010), pp. 25-34. “Information Transmission between the Gulf Equity Markets of Saudi Arabia and Bahrain.” Research in International Business and Finance , Vol. 20, No. 3 (2006), pp. 276-285. “Have Institutional Investors Destabilized Emerging Markets?” Working paper 96/34, International Monetary Fund, 1996. “Trading Volume, Time-Varying Conditional Volatility, and Asymmetric Volatility Spillover in the Saudi Stock Market.” Journal of Multinational Financial Management , Vol. 19, No. 2 (2009), pp. 139-159. “Do Stock Price Indices Respond Asymmetrically? Evidence from China, Japan and South Korea.” Journal of Asian Economics , Vol. 14, No. 4 (2003), pp. 541-563. “Emerging Markets Finance.” Journal of Empirical Finance , Vol. 10, No. 1-2 (2003), pp. 3-55. “Does Financial Liberalization Spur Growth?” Journal of Financial Economics , Vol. 77, No. 1 (2005), pp. 3-56. “International Stock Return Comovements.” The Journal of Finance , Vol. 64, No. 6 (2009), pp. 2591-2626. “Studies of Stock Price Volatility Changes.” Proceedings of the 1976 Meetings of the American Statistical Association , (1976), pp. 171-181. “National Intellectual Capital Index A United Nations Initiative for the Arab Nations.” Journal of Intellectual Capital , Vol. 5, No. 1 (2004), pp. 13-39. “Investor Sentiment and the Near-Term Stock Market.” Journal of Empirical Finance , Vol. 11, No. 1 (2004), pp. 1-27. “Investor Sentiment and Asset Valuation.” Journal of Business , Vol. 78, No. 2 (2005), pp. 405-440. “Analyzing and Forecasting Volatility Spillovers, Asymmetries and Hedging in Major Oil Markets.” Energy Economics , Vol. 32, No. 6 (2010), pp. 1445-1455. “Stock Market Efficiency Revisited: Evidence from the Amman Stock Exchange.” The Middle East Business and Economic Review , 3 (1991), pp. 27-31. “Measuring the Cost of Equity in African Financial Markets.” Emerging Markets Review , Vol. 7, No. 1 (2006), pp. 67-81. “Contagion: A Fear for African Equity Markets?” Journal of Economics & Business , Vol. 55, No. 5 (2003), pp. 405-426. “Financial Sector Development in Middle East and North Africa.” Working paper, 04/102, International Monetary Fund, 2004. Impact of International Terrorism on Commodity Markets . Saarbrücken, Germany: LAP Lambert Publishing, 2015. “Volatility Transmission from Mature Global Stock Markets to Middle East and North African Stock Markets.” Accounting and Finance Research Journal , Vol. 2, No. 1 (2013), pp. 19-31. “Integration of the Middle East and North African Stock Markets with Global Stock Markets.” International Journal of Academic Business World , Vol. 5, No. 2 (2011), pp. 51-61. “Investor Psychology and Security Market Under- and Overreactions.” The Journal of Finance , Vol. 53, No. 6 (1998), pp. 1839-1885. “Are the Arab Maghreb Countries Really Integratable? : Some Evidence from the Theory of Cointegrated Systems.” Review of Financial Economics , Vol. 11, No. 2 (2002), pp. 79-90. “Global Asset Allocation: Risk and Return Trade-Off on Emerging Stock Markets.” In Risk Management in Emerging Markets , pp. 35-55. New York: Palgrave Macmillan Publishers, 2005. “Microstructure Changes and Stock Price Behavior, Evidence from Casablanca Stock exchange.” NASDAQ-Notre Dame Microstructure Conference, Paris, 2000. “Distribution of the Estimators for Autoregressive Time Series With a Unit Root.” Journal of the American Statistical Association , Vol. 74, No. 366 (1979), pp. 427-431. “Likelihood Ratio Statistics for Autoregressive Time Series with a Unit Root.” Econometrica , Vol. 49, No. 4 (1981), pp. 1057-1072. Elements of Forecasting . South-Western College Publishing, 2003. “The Law and Economics of Self-Dealing.” Working paper 11, National Bureau of Economic Research, 2005. RATS User’s Manual . Evanston, IL: VAR Econometrics, 1988. “Forecasting and Conditional Projection Using Realistic Prior Distributions.” NBER Working Papers 1202, 1983. “Cointegration and Unit Roots.” Journal of Economic Surveys , Vol. 4, No. 3 (1990), pp. 249-273. “Beta, Size, Risk and Return.” The Journal of Financial Research , Vol. 23, No. 3 (2000), pp. 245-260. Economic Intelligence Unit. “Global Forecasting Service: The Middle East and North Africa Growth and Inflation.” EIU Report, 2016, http://gfs.eiu.com/Article.aspx?articleType=rf&articleid=1104822494&secId=0 . “Volatility Dependence and Contagion in Emerging Equity Markets.” Working paper, IASE Seminar, 2001. “Foreign Direct Investment in the Arab World: The Changing Investment Landscape.” In The Arab World Competitiveness Report 2002-2003, The World Economic Forum . New York: Oxford University Press, 2003. “Emerging Equity Markets in Middle Eastern Countries.” International Monetary Fund Staff Paper No. 42 (1995), pp. 313-343. RATS Programming Manual . Evanston, IL: ESTIMA, 2003. “Measuring and Testing the Impact of News on Volatility.” The Journal of Finance , Vol. 48, No. 5 (1993), pp. 1749-1778. “Forecasting International Equity Correlations.” Financial Analysts Journal , Vol. 50, No. 6 (1994), pp. 32-45. “Regional Financial Integration in the GCC.” IMF Working Paper 10/90, 2010. “The Cross-Section of Expected Stock Returns.” The Journal of Finance , Vol. 47, No. 2 (1992), pp. 427-465. “On the Conditional Relationship between Beta and Return in International Stock Returns.” International Review of Financial Analysis , Vol. 9, No. 3 (2000), pp. 235-245. FTSE Russell. “Frontier Markets Accessing the Next Frontier.” FTSE Russell Market Overview Research, 2015, http://www.ftse.com/products/downloads/FTSE_Frontier_Markets_Overview.pdf . “Financial Integration, Regulation and Competitiveness in Middle East and North African Countries.” Managerial Finance , Vol. 33, No. 7 (2007), pp. 461-467. “Learning to be Overconfident.” Review of Financial Studies , Vol. 14, No. 1 (2001), pp. 1-28. “The Rise and Fall of the New Zealand Underground Economy: Are the Responses Symmetric?” Applied Economics Letters , Vol. 6, No. 3 (1999), pp. 185-189. Econometrics by Example . New York: Palgrave Macmillan, 2012. “Correlations in Price Changes and Volatility across International Stock Markets.” The Review of Financial Studies , Vol. 3, No. 2 (1990), pp. 281-307. “Shock and Volatility Spillovers among Equity Sectors of the Gulf Arab Stock Markets.” The Quarterly Review of Economics and Finance , Vol. 49, No. 3 (2009), pp. 829-842. “Regional Adjustment to Trade Liberalization.” Regional Science and Urban Economics , Vol. 28, No. 4 (1998), pp. 419-444. “Predicting Risk and Return in Emerging Markets.” Review of Financial Studies , 8 (1995), pp. 773-816. “International Asset Pricing with Alternative Distributional Specifications.” Journal of Empirical Finance , Vol. 1, No. 1 (1993), pp. 107-131. “Integration and Fluctuations: The Case of MENA.” Emerging Markets Finance and Trade , Vol. 40, No. 6 (2004), pp. 48-67. “Bad News Travels Slowly: Size, Analyst Coverage and the Profitability of Momentum Strategies.” The Journal of Finance , Vol. 55, No. 1 (2000), pp. 265-292. “A Unified Theory of Underreaction, Momentum Trading and Overreaction in Asset Markets.” The Journal of Finance , 54 (1999), pp. 2143-2184. “An Analysis of Asymmetry in Foreign Currency Exposure of the Australian Equities Market.” Journal of Multinational Financial Management , Vol. 10, No. 2 (2000), pp. 133-159. “The Behavior of Retail Gasoline Prices: Symmetric or Not?” Federal Reserve Bank of St. Louis Bulletin, 73 (1991), pp. 19-29. “Transmission of Volatility between Stock Markets.” Review of Financial Studies , Vol. 3, No. 1 (1990), pp. 5-33. “Stock Market Predictability in the MENA: Evidence from New Variance Ration Tests and Technical Trade Analysis.” IIIS discussion paper No. 92, Trinity College, Dublin, 2005. “Time-Varying Behavior and Asymmetry in EMS Exchange Rates.” International Economic Journal , Vol. 15, No. 4 (2001), pp. 81-94. “Shock and Volatility Transmission in the Oil, U.S. and Gulf Equity Markets.” International Review of Economics & Finance , Vol. 16, No. 3 (2007), pp. 357-368. “Does Stock Market Liberalization Spur Financial and Economic Development in the MENA Region?” Journal of Comparative Economics , Vol. 36, No. 4 (2006), pp. 673-693. “Volatilities in Emerging MENA Stock Markets.” Thunderbird International Business Review , Vol. 48, No. 4 (2006a), pp. 455-484. “Portfolio Management and Financial Market Integration of Emerging MENA Stock Markets.” In Global Stock Markets and Portfolio Management , Vol. 4 (2006b), pp. 37-54. London: Palgrave and Macmillan. “Stationarity and Persistence in the GARCH (1, 1) Model.” Economic Theory , Vol.6, No. 3 (1991), pp. 318-334. “Lessons for International Asset Allocation.” Financial Analysts Journal , Vol. 49, No. 2 (1993), pp. 63-77. “Prices Rise Faster than They Fall.” Journal of Political Economy , Vol. 108, No. 3 (2000), pp. 466-502. “The Conditional Relation between Beta and Return.” Journal of Financial and Quantitative Analysis , Vol. 30, No. 1 (1995), pp. 101-116. “Cointegration and Speed of Convergence to Equilibrium.” Journal of Econometrics , Vol. 71, No. 1-2 (1996), pp. 117-143. 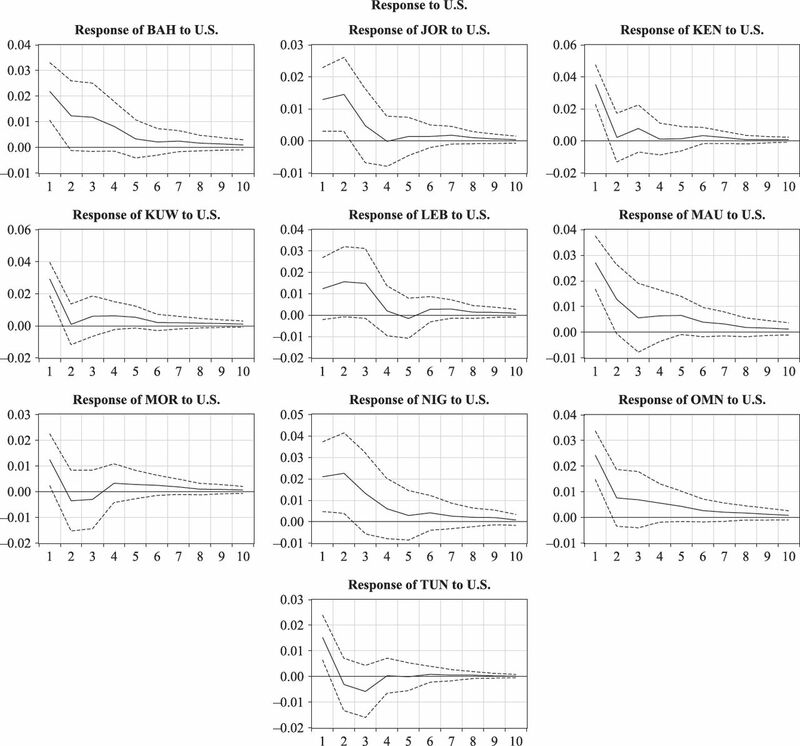 “Generalized Impulse Response Analysis in Linear Multivariate Models.” Economics Letters , Vol. 58, No. 1 (1998), pp. 17-29. “Scratching the Surface of Collaborative and Associative Governance: Identifying the Diversity of Social Action in Institutional Capacity Building.” Environment and Planning A , Vol. 32, No. 1 (2000), pp. 111-130. “Macroeconomic and Reality.” Econometrica , Vol. 48, No. 1 (1980), pp. 1-49. “The Prospects for Regional Economic Integration between China and the Five Central Asian Countries.” Europe-Asia Studies , Vol. 56, No. 7 (2004), pp. 1059-1080. “Transitory and Permanent Volatility Components: The Case of the Middle East Stock Markets.” Review of Middle East Economics and Finance , Vol. 4, No. 2 (2008), pp. 1-14. “Globalization, Strategic Co-Operation and Economic Integration among Islamic/Arab Countries.” Management Research News , Vol. 25, No. 4 (2002), pp. 35-61.